Bourke Hire have been in the Marquee hire and event industry for over 50 years. We are a family owned company established by founder Kevin Bourke in the 1960s. The tradition continues with Kevin's daughter Fiona and her husband Christopher King continuing to provide service to the event industry. We pride ourselves on being a family owned business with a tradition of excellence, personal service and professionalism. We put an enormous value on relationships, which allows us to design and deliver a wide variety of fantastic and amazing events which make a real difference to our clients. We take great pleasure in being involved in all types of functions from small family gatherings to large scale events. We provide quality products and each item you hire has been cleaned, checked and serviced before it is delivered. Our courteous team will make every effort to ensure a timely delivery and pick up. We take a long term view with our customers and believe in building lasting relationships. Bourke Hire began as a farm machinery business in 1959 with Barry Bourke. In 1960 his brother Kevin Bourke joined the business and they instigated a local Machinery Field Day in order to promote the business. Barry later retired from the business due to ill health. A small marquee was required for cooking demonstrations. Kevin was able to hire a small circus marquee from a retired circus performer. The Field Day was a huge success and ran for 5 years. Kevin saw the potential for hiring marquees and other equipment for events, parties and weddings and purchased two second hand circus marquees. Kevin realised Bourke Hire were on the right track and purchased chairs, built trestle tables and other allied equipment. As Machinery Field days became popular Bourke Hire serviced them all, most for their first event. These included Wimmera Machinery Field Day Horsham, Mallee Machinery Field Day Speed, Gippsland Machinery Field Day Lardner Park and Henty Machinery Field Days. Just prior the first Henty Field Day, Kevin had purchased a new yellow marquee which was used at the event. Bourke Hire are still major suppliers to these Field Days some 50 years on. Another area that Bourke Hire pioneered in the early years was the “on farm stud beef cattle sales. ” Stud sales began at a similar time to the Field Days and predominately involved Murray Grey, and Hereford Stud Cattle. The sales took Bourke Hire to all regions of Victoria, Southern NSW and Tasmania. In order to service these events Kevin designed and built special portable sale yards and tiered seating. Bourke Hire’s exposure at these major events gave us great publicity and enquiries began to come from near and far for our services. Weddings, centenary celebrations, civic and state events. Bourke Hire’s custom built and designed tiered seating was hired by Tennis Australia for use at Kooyong for several years prior to the development of The National Tennis Centre. The seating was also used for major golf and bowls tournaments in Melbourne and Sydney for some years. 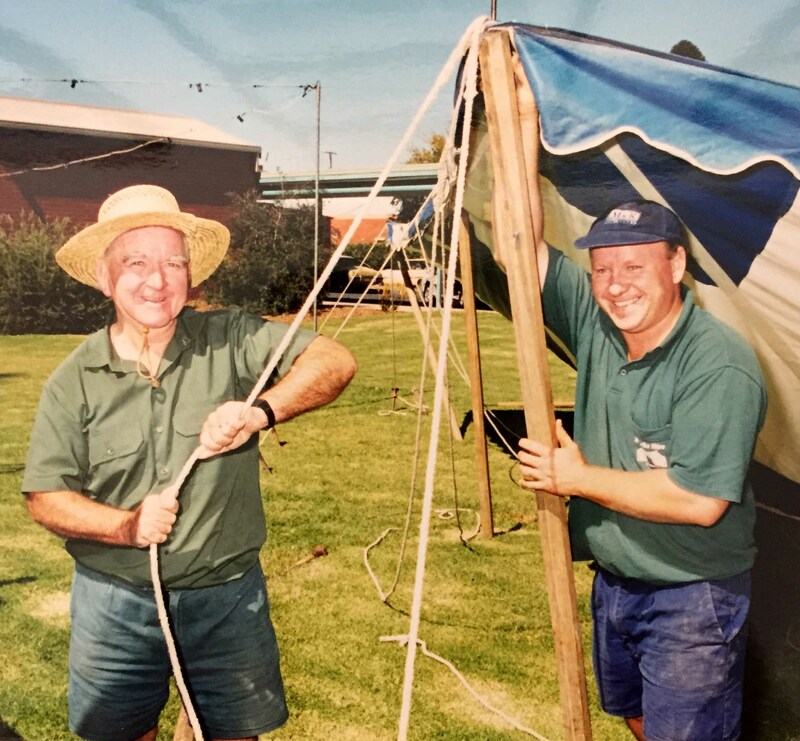 In 1998 Kevin retired and his daughter Fiona and son in law Christopher King took over the business keeping it in the family and have continued to service field days, events and private functions all over Victoria and southern NSW.